Wrap Yamaha’s renown keyboard technology in a lightweight, portable package, and you’ve got a digital sound system built for endless hours of musical learning and fun. 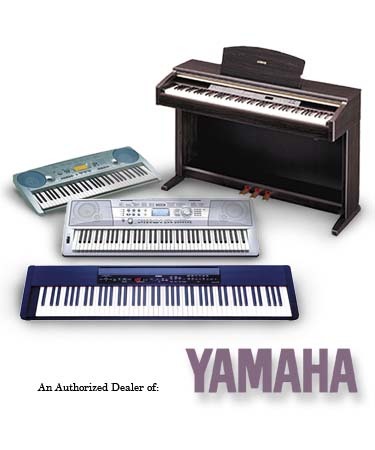 Compact enough for some of the snuggest living spaces, our line of 61, 76 and 88-key Yamaha portable keyboards offer computer-ready capability with touch-sensitive keys and a wide array of voices and rhythm styles. Choose from models with full rosewood style cabinetry or portable standalone 88-key pianos, offering the same lifelike feel and sound for home or stage. Wakefield Music also carries a wide range of accessories and supplies including stands, benches, headphones, amplifiers, pedals, adaptors, metronomes, MIDI cables, software and of course our vast selection of methods, sheets, books and collections to help cultivate your passion and joy of music. Wakefield Music offers a professional staff of over six teachers providing lessons to beginners to advanced students covering most styles including jazz, classical, folk, rock, blues and more. Visit our lesson page for more info. We also present workshops and clinics as well. Past artists featured include Pierre Bensusan, Doyle Dykes, Mark Hanson, Peppino D’Agostino, Paul Geremia, Beppe Gambetta, Artie Traum, Wendy Waldman and others.